As first reported by Howard Beck of the New York Times and subsequently confirmed by Yahoo! 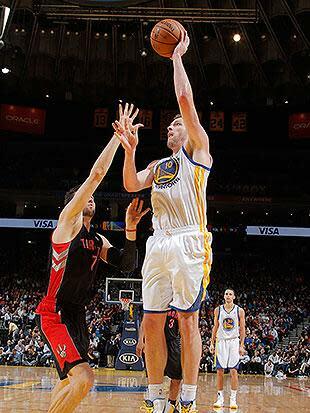 Sports NBA columnist Adrian Wojnarowski, the Toronto Raptors will send Andrea Bargnani to the New York Knicks in exchange for sharpshooting reserve Steve Novak, backup center Marcus Camby, New York's 2016 first-round draft pick and a pair of future second-rounders — at a minimum. The two sides were unable to finalize the initial iteration of the deal before the clock struck midnight on Monday morning, marking the start of the league's new fiscal year and the onset of new salary figures for all the players involved in the deal. Bargnani's salary increased by $750,000, while the total amounts owed to Novak and Camby decreased by just over $510,000; for the deal to work under the salary-cap rules in the NBA's collective bargaining agreement, the Knicks will have to send another player north of the border, with minimum-salaried reserves Quentin Richardson and Earl Barron appearing to be likely targets. The inability to finish the transaction before the calendar flipped to July 1 reportedly doesn't indicate cold feet by either side in getting it done — in fact, Yahoo! Sports NBA columnist Marc J. Spears reported shortly after the midnight ET opening of free agency that the two sides had completed and agreed in principle on a revamped deal — but the specific adjustment isn't yet known, and the contents of the deal could still shift before pens can be set to paper on July 10, following the league's moratorium on trades and free-agent signings. The persistent interest makes all sorts of sense from Toronto's perspective. While former Raptors personnel boss Bryan Colangelo was inexorably tied to Bargnani after not only drafting him first overall in 2006 but also giving him a (head-scratching, even at the time) five-year, $50 million extension in the summer of 2009, a new Raps regime led by recently hired former Denver Nuggets general manager and reigning NBA Executive of the Year Masai Ujiri had no such sentimental attachment; after taking the Raptors' reins on June 1, Ujiri reportedly made moving Bargnani his "first order of business." • And, most importantly, Bargnani hasn't really been very, or any, good for the past couple of seasons. He grabs an astoundingly low share of available rebounds for a 7-footer, a persistent problem that reached its nadir last season, when he posted a lower rebound rate (7.6 percent of possible caroms) than the average small forward/shooting guard and the lowest of any power forward to play at least 10 games and average at least 10 minutes per game. He's not an especially gifted facilitator, averaging 1.5 assists per 36 minutes over the course of his seven-year career; this is extra bad when you consider that he averages two turnovers per-36. These faults — the defensive liability, the absent rebounding, the underwhelming playmaking — are generally accepted truths about Bargnani's game through a 444-game NBA sample, and unlikely to meaningfully improve at the age of 27. To whatever extent he has made up for those flaws throughout his career, it's been as a result of a deep shooting stroke that can draw opposing big men out of the paint; he shot 37.6 percent from 3-point range through his first four NBA seasons, exploding just often enough to keep alive the hope that he'd figure out how to become a consistent and reliable offensive focal point. As he took on more responsibility and took more shots in the Raptors' offense over the last three seasons, though, his accuracy and efficiency dwindled. He shot a tick under 40 percent from the floor and 31 percent from deep last season, due in part to a pair of injuries to his shooting elbow and partly, perhaps, to a seeming disinterest in getting in shape. 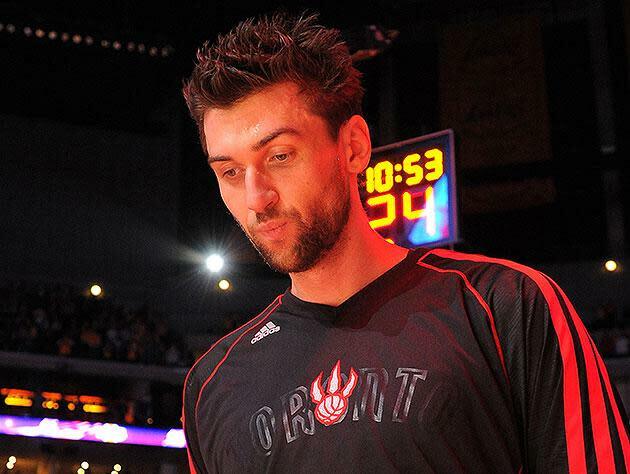 With that long-range stroke and scoring acumen falling by the wayside, there really wasn't too much left to Bargnani — if he couldn't carry his share of the offensive load, he was just an overpaid, underperforming albatross with no place in a Toronto future that will be built on frontcourts featuring Rudy Gay, Amir Johnson and Jonas Valanciunas. He was an afterthought whom most observers figured would net zero actual value in trade, and who was considered among the league's most likely candidates to be jettisoned via the CBA's amnesty provision. So, y'know, enter the Knicks. You can certainly make the argument (as some have) that the Knicks didn't lose a ton of on-court value in the deal, considering age and injury limited the 39-year-old Camby to just 253 minutes in his return season to New York and that Novak — while a more accurate and less expensive 3-point shooter than Bargnani — completely fell out of coach Mike Woodson's rotation in the postseason. You can make the argument (as some have) that a fresh start in a new city with a new role could be just what the doctor ordered for Bargnani, that working with shooting coach Dave Hopla could help Bargnani rediscover his rhythm and that a long spring, summer and fall to get healthy could do wonders for the former top overall pick. These are possibilities; Bargnani does still have talent, after all. Still, it's difficult to see how adding Bargnani to the mix meaningfully moves the needle in a positive direction for the Knicks. While the Knicks were repeatedly victimized by the size and interior strength of the Indiana Pacers in their six-game second-round playoff loss, Bargnani doesn't offer much in the way of rim protection, low-post muscle or in-the-paint grit; he also doesn't figure to improve what was a middling defense in terms of points allowed per possession last season. Given how successful the Knicks were last season with Carmelo Anthony at the power forward spot, it seems like the prudent move would be to bring Bargnani off the bench to provide an offensive boost; then again, the Knicks still employ Amar'e Stoudemire, and while you can kind of get on board with the idea of Amar'e operating out of the post while Andrea spaces the floor, the idea of defensive units pairing Stoudemire and Bargnani is likely already giving Knicks fans nightmares. Plus, while Bargnani profiles as a stretch four in today's NBA, meaning his addition would seem to jive (to some degree) with the small-ball identity the Knicks fashioned last year, if the addition of another power forward winds up pushing Anthony down to small forward more often, that would seem to run counter to the Melo-at-the-four plus one big and three shooters/playmakers strategy. So while the Knicks might not have given up much on-court value in the swap, they might not have added much, either. And then, of course, you think about the future. The 2016 first-round pick the Knicks will give up for Bargnani had already been included in a prior trade with Ujiri, as Denver received the right to swap '16 first-rounders with New York in the deal that brought Anthony to Manhattan. The Knicks gave up their 2014 first-rounder in that deal, too, and sent off next year's second-round pick, as part of the 2012 deal that sent Toney Douglas, Josh Harrellson and Jerome Jordan to the Houston Rockets for Marcus Camby. The two second-rounders the Knicks will reportedly send Toronto include a '14 selection they received from the Oklahoma City Thunder for Ronnie Brewer at this past February's trade deadline; the Knicks own the rights to one more '14 second-rounder, which once belonged to the Sacramento Kings but went to the Boston Celtics in 2009, then was conveyed to New York as part of the Nate Robinson deal in 2010, but New York only gets that pick if it falls between picks No. 56 and 60, which means they're not likely to see it. That means the Knicks will most likely be without a draft choice in what some have projected to be the deepest draft in years. The Knicks have also given up their second-rounders in '15 (in the Houston deal) and '16 (in the trade that brought Raymond Felton back from the Portland Trail Blazers). New York's 2017 second-rounder will go to the Raptors, for Bargnani, too. It's true that draft picks don't always fulfill their promise; you absolutely don't have to remind Knicks fans of that. But teams that are over the salary cap and luxury tax — the Knicks are on the books for more than $77 million this year and next before this deal goes through — have precious few instruments under the new collective bargaining agreement for adding talent, let alone young, inexpensive, cost-controlled talent. The draft affords that opportunity, whether by making your own selections or by using a cache of available selections to pluck a young asset like Thomas Robinson, whom the Blazers just snagged from the Rockets for a pair of second-rounders and European prospects. Having draft picks gives you options; not having them eliminates options. The Knicks, now, have very few options at inexpensively improving their existing core in the years ahead or developing foundational talent to have on-board beyond the 2014-15 season, when just about everybody comes off New York's books and a grand reset seems likely, and in the three years afterward, too. They have traded away said options in the hope that a high-priced player with a recognizable name who'd become persona non grata in his previous stop will be able to turn his declining fortunes around under the bright lights of Madison Square Garden. Knicks fans have heard this tune before. It's got a bad beat, and you can't dance to it. But that doesn't mean James Dolan and company plan to stop playing that same old song over and over and over again.